Mighty Morphin Power Rangers SNES Super Nintendo Game Cartridge Cleaned Tested and Guaranteed to Work! Don't look now, because her Hideousness is back and she's meaner and uglier than ever. This time Rita Repulsa is out to pulverize the Power Rangers once and for all and she's brought all of her nasty friends along to do the dirty work. But, Jason, Trini, Billy, Kimberly, and Zack are at their morphing best with the awesome power of the Super NES machine on their side. Incredible graphics, amazing sound, and unbeatable action make this battle of good and evil an instant SNES classic. The game features seven challenging levels of play ending with breathtaking, all-out battles against Rita's most fearsome henchmen including Bones, Eye Guy, and many more! Only the power of the Super NES can put all of the characters and excitement of the phenomenal hit TV series right at your fingertips. So what are you waiting for? Morph into action now with the Mighty Morphin Power Rangers. 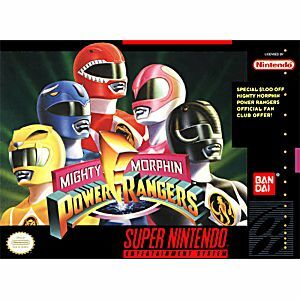 A Good Game Didn't Have The Green Ranger. The game I purchased is in excellent condition and was fairly priced. My son is enjoying it daily, Thank you! I was, like a lot of kids, a fan of the show back when it first came out. Unfortunately it stopped being quiteas good after Time Force, although Mystic Force was admittedly pretty cool. 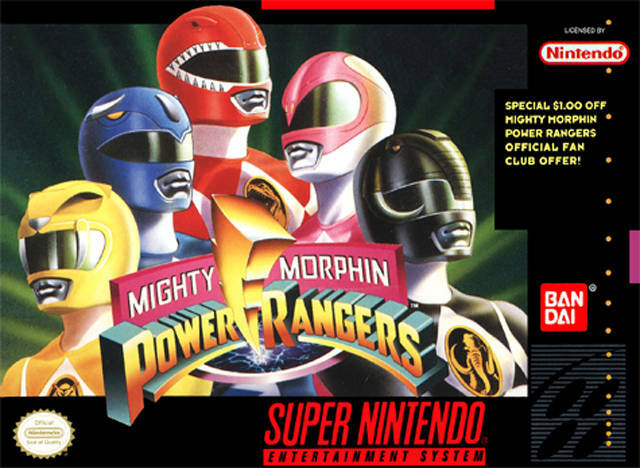 But the original Mighty Morphin' Power Rangers game is definitely a lot of fun. You fight your way through seven action-packed levels as you fight off the alien hoards of the evil sorceress Rita Repulsa, who seems to have launched an all-out assault on Angel Grove.. The first five levels play pretty much the same. You pick from the five original rangers, Billy, Zack, Kim, Jason and Trini. For the first half of the level you fight in ordinary teenager form, then at about the halfway point you morph into your Ranger form and fight with your Ranger weapon. Zack wields the Power Axe, Kim the Power Bow, Billy the Power Lance, Trini the Power Dagger and Jason the Power Sword. All five rangers also have access to a special weapon, a power bomb that will eradicate all enemies onscreen or, in the case of bosses, cause massive damage to them. Each of the first five levels features a boss at the end, picked from the various monsters of the show, from Bones to Eye Guy to the Gnarlie Gnome and even the deadly Nasty Knight. The final two stages see the Megazord enter the fray as you face the Hatchosaurus and later, one of the Rangers' most deadly adversaries, Goldar's massive zord Psyclopsis. The sound effects are your standard beat 'em up fare but they're cool and they get the job done nicely. The music is another story. Every track features a rocking beat that gets you pumped up for battle. The intro is a surprisingly well-done version of the show's classic theme complete with vocals, though instead of singing Go Go Power Rangers it simply says Go Go Power Ranger. An instrumental version of this theme plays whenever you morph and again during the two Megazord stages. The main stage themes are also very nice as is the extremely uptempo boss theme. There's also a triumphant rehashing of the Go Go Power Ranger theme whenever you clear a stage. Even the game over theme leaves you with an I'll be back feeling. The ending theme is also well-done and gives you a feeling of accomplishment. My only complaint with the game is that there's really no story to it and Zordon and Alpha, the Rangers' ever-present mentors, are utterly absent. 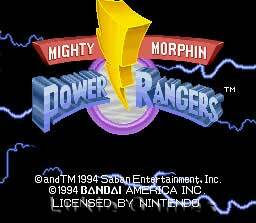 Even so I still very much recommend this game, particularly if you were a Power Rangers fan bac in the day. The game even features a unique two-player battle mode that you access with three specific passwords the game gives you once you complete the main game. 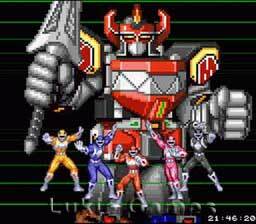 Here one player takes control of the Megazord while the other controls one of the two final bosses. The reason there are three passwords for the two-player mode is that while one password will unlock Megazord versus Hatchosaurus, the other two passwords will pit the Megazord against Cyclopsis, which you fight in two forms in the main game. In battle mode you determine which form you play as by which password you enter. And yes, you have access to all those bosses' abilities when you play them in battle mode. So even after the main game is over you can still have some fun with it. Definitely give this one a go. received in mint conditon and awsome game !!! Very fast shipping and good condition game thanks!